Mary assumes that Blake and Napier are there primarily to advise and ensure that the estates endure and succeed through these troubling times. Blake, however, reveals that was not the case -- that they are more concerned with their effect on the overall economy. Blake and Mary immediately begin making rude remarks against one another, such as when Mary and her brother-in-law decide to branch out to pig farming. He calls her a sentimentalist who cannot face the truth. Mary remarks to Napier that Blake is a "traitor" and then an "enemy" because she felt he was not on their side. Blake himself told Napier that he did not like Mary because she felt entitled to her wealth as an aristocrat and she would never work for it. He feels that sort of person does not deserve to survive. Napier tells Blake Mary feels precisely that way about him. Blake begins to respect Mary more when she willingly dirties herself alongside him in order to help the newly arrived pigs because they are in desperate need of water. Later that night, they share an intimate meal of scrambled eggs that Mary cooks in the servants' hall. 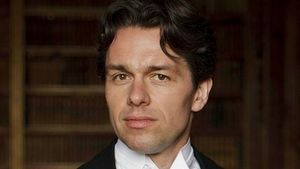 Mary's former suitor, Anthony Gillingham, returns to Downton, and it is revealed he is an old friend of Blake's from the war. They had served together aboard the Iron Duke with Jellicoe and both had been at Jutland. By the time of the bazaar, Blake returns to see Mary, as he is now very attracted to her and had been thinking about her a good deal. She seeks his counsel regarding hers and Anna's suspicion that the death of Gillingham's valet, Green, may have been no accident, without revealing any details. He makes plain his feelings for her, but she gives him no answer, citing she has disappointed other men already (Gillingham and Napier, specifically). Blake appears at Grantham House hoping to take Mary to lunch. They later attend an art exhibition, where they run into Rose, Lord Gillingham, and Rose's newest acquaintance, Freda Dudley Ward, a married woman and mistress of the Prince of Wales. Mrs Ward appears to know Blake well, as she later talks to him a couple times. He even refers to her by her first name, suggesting they are very close. Mary comes to Blake for help when a letter from the Prince to Mrs Dudley Ward is stolen by Terence Sampson (he accompanies her and Rose to Sampson's flat to look for the letter, while Lord Grantham keeps Sampson occupied with a card game). He thanks her for this. He continues to profess his love for Mary, and tells her he believes in the future and thinks she can too. He is clearly jealous when she dances with Lord Gillingham at a ball at Grantham House, although she later dances with him too. Mary feels a relationship with Blake might not work, and that they could not pull together as a team because her duty is to preserve Downton for her son, while Blake is an outsider on the opposite side. However, much to her surprise, she learns from Gillingham himself that Blake is actually not an outsider. In fact, he is the heir to a baronetcy and one of the largest estates in Ulster through a distant cousin of his father's, Sir Severus Blake, something that, according to Gillingham, Blake has always played down. Gillingham even remarks that Blake is going to be a more eligible bachelor than he is -suggesting the estate and fortune that Blake stands to inherit are all greater than his own (although his title would not match Gillingham's, as a baronet is two ranks below a viscount and not, in fact, an actual peer). Blake later explains to Mary that he had not mentioned these facts about his past first because he did not want her to think he shared similar prejudices just because he came from a similar background, and later when he fell in love with her, he wanted to win her on his own without her knowing about his inheritance.